Well, close enough; but not really. Truth be told, there used to be, in the school where I used to work, this Brother who was the spitting image of the late comedian Redford White. This anecdote revolves around that Brother. 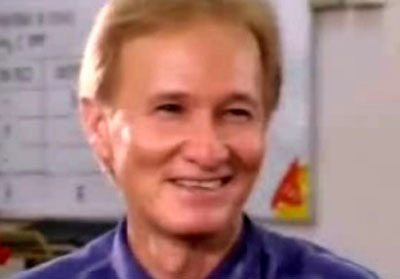 For those of the younger generation, Redford White was this television and movie personality whose real name was Cipriano Cermeño II. He first became famous in the late seventies, playing a supporting role in the hit television sitcom called Iskul Bukol. He had this great chemistry with the by-now ageless comedic trio of Tito, Vic and Joey. Soon, he was starring in movies such as Boni and Klayd, Darakula and Hee Man – Master of None. He would also later star in another hit television sitcom, Buddy en Sol. Iskul Bukol was one of the shows that we used to watch when I was still in my teens. Its humour was raunchy and even bordered on being retardate; but of the sort that appealed to teenagers, anyway. Sometimes, Mom would watch with us. Thus, she knew who Redford White was. As things would have it, coincidentally, there was this young Brother assigned to Lipa whose name was Danny. His surname eludes me at the moment. At the time, I was still in college in DLSU-Manila. I did not really know the Brother yet; although my younger sister and brother, who were still in high school in Lipa, certainly did. Later, when I joined the school’s teaching staff, I became acquainted with him. I found him to be a very straightforward and pleasant man. He enjoyed a great relationship with most of the teachers and was very popular with the students. At any rate, the incident that this anecdote is all about happened when I was still in college and home for the summer break. It was fiesta at our parish. Inevitably, although some of our fiesta guests would be former neighbours inside the Air Base where we used to live, classmates of my younger brother and sister would also come. We never had a buzzer installed at the front gate. Mom preferred dogs; and we used to have really noisy ones who would bark loudly whenever there were strangers standing in front of the gate. Nearing lunchtime, the dogs started barking animatedly. Sure enough, there were some teenagers standing in front of the gate. They wanted to know if my sister was in. She was; and quickly went outdoors to let her classmates in. Mom was already entertaining some friends at the living room. She could see that my sister’s classmates were accompanied by this tall, fair-skinned young man. Mom had this strange look on her face. Mom was gracious as ever with the new arrivals; and this being Lipa, it was a big deal to have a Brother visit one’s house. The curious look on her face disappeared after the introductions were made. Later in the day, when we were by ourselves, Mom finally told us what she initially thought when she first laid her eyes on Brother Danny. “Nagtataka ako,” my Mom told my sister, “bakit kasama ng mga classmates mo si Redford White?” We burst out laughing. Frankly, those were my thoughts as well. I had not seen the Brother before. And like my Mom, I did wonder what the television personality was doing in front of our house.